Last edited by bring_it_on on 30 Mar 2015, 23:23, edited 1 time in total. Last edited by spazsinbad on 30 Mar 2015, 20:21, edited 1 time in total. Here's another, more relevant given the ABC program.. Recent Airborne Aero-Optics Laboratory In-Flight Waveform Measurements of Aero-Optics and Implications for Aero-Optics Beam Control in Tactical laser Weapons. bring_it_on wrote: Thanks. ..Recent Airborne Aero-Optics Laboratory In-Flight Waveform Measurements of Aero-Optics and Implications for Aero-Optics Beam Control in Tactical laser Weapons. ..
How much electrical power is required for HEL? How can the JSF currently provide the power required for the HEL? Is that power requirement possible in a future configuration of the JSF? Related question, was this system part of the requirements set for F-35s unique 270v DC power supply? They are long (250-300 pages ) but I believe them to be worth it as the analysis is quite good. I'll post more on the future in terms of what capability at the Propulsion level is being looked at and how more demand is being met over the longer arc of time under various AFRL efforts such as INVENT and the broader VAATE. "...the concept for integrating a SSL [Solid State Laser] into the F-35 Joint Strike Fighter would place the laser system in the fan cavity of the short-take-off-and vertical-landing version of the aircraft and use the fan shaft to power a megawatt-sized generator..."
"A weapon that used to be the size of a passenger jet now fits on the back of a flatbed truck...."
It has been repeated twice above now - the updated link to the NG PDF. HELLADS at 150kW in a750Kg/ 3-cubic meter footprint good enough to destroy aircraft for airborne testing in 2018. Can't wait. A megawatt-class electric laser installed on a F35B? Way better. IMO Congress and the public are going to fall in love with these things and fund them. They all grew up watching Star Wars. MW would be the power requirement..The laser being talked about would be about 100 KW and the papers I have seem to suggest that such a capacity is good for a2a and some a2g, although it may not cover all the a2g work/mission. A 100KW system would require around 1.1 MW of power. Even a 40KW podded system packs a punch. Why would they put laser on a submarine ? A lot lot more. I would suggest that you take some time and read some of the resources presented in this thread. Keep in mind that the range depends upon the sort of target and its a combination of distance and time (among others such as clouds etc) that ultimately determines destruction. 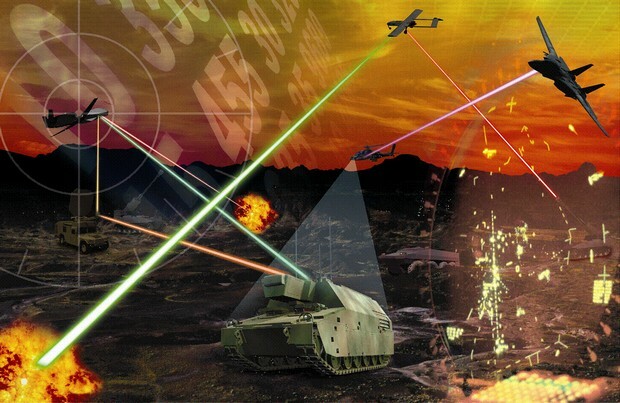 Lasers with power levels around 25 kW can be used in a defensive mode, such as negating ground-to-air missiles. Lasers with 50 kW begin to offer offensive air-to-air capabilities. To provide lethal air-to-ground effects, at least 100 kW of output power is needed. A more detailed explanation of the various missions in the air-to-ground domain are given in the Mansfield paper which itself is cited by most of the academic work on the matter that I have come across. Last edited by bring_it_on on 31 Mar 2015, 03:29, edited 2 times in total. Read the article, my bad. Still a very useful capability and worth pursuing.